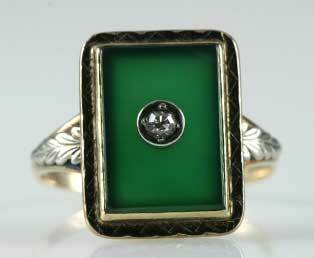 This rectangular shaped estate green onyx diamond ring is fantastic. This vibrant green chalcedony ring (onyx) features a bezel mounted diamond pierced into the center. A slender engraved gold mounting frames this bright apple green chalcedony. Engraved white gold leaves adorn the shoulders of this ring, while adding an extra dimension to this ring while crafted in two shades of 14kt 585 gold.